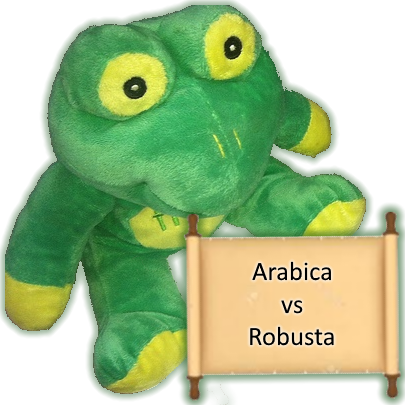 What is the Arabica vs Robusta debate? We list the differences between the two best know varieties of coffee consumed by humanity. Arabica or “Coffea Arabica” is a species of coffee indigenous to Ethiopia and Sudan, specifically it is accepted in the Kaffa forest region. Coffea Arabica is believed to be the first species of coffee to be consumed and then cultivated. For over 1,000 years it has been grown in southwest Arabia. It is considered to produce better coffee than the other major commercially grown coffee species,Coffea canephora (Robusta) and the lesser known or used Coffea Liberica (Liberica). Arabica contains less caffeine than any other commercially cultivated species of coffee. Wild plants grow to between 7-12 m tall, and have an open branching system; the leaves are opposite, simple elliptic-ovate to oblong, 6-12 cm long and 4-8 cm broad, glossy dark green. The blossoms (flowers) are produced in auxiliary clusters, each flower white, and 1-1.5 cm in diameter. The fruit is a berry 10-15 mm long, maturing bright red to purple (in most varieties, and also found in yellow and orange),containing two seeds (the coffee ‘bean’). Arabica is considered better taste, but more expensive than Robusta. The Arabica trees grow in semi-tropical climates near the equator, both in the western and eastern hemispheres, at high altitudes. Because ripe pure Arabica cherries (un-roasted green beans) fall to the ground and spoil, they must be carefully monitored and picked at intervals, which increases production costs. With coffee being so popular and Robusta being so bitter, there was a demand for an Arabica that could be easily cultivated, easily grown and would be more robust. Arabica beans were used as a source for this and Robusta qualities added. This resulted in a bean that was easier to cultivate. However it also had significantly higher amounts of caffeine. This was good for chasing away the insects in the areas the tree was cultivated (initially Brazil), however since caffeine is bitter, it affected the taste so these modified Arabica derivatives are better-tasting than Robusta and can be produced under simpler conditions than pure Arabica, but it tastes nowhere near as great. Unfortunately most of the world’s acclaimed coffee brands rely on this man-made sister to the Arabica bean. Brazil is by far the most prolific producer of this hybrid. Published findings in the journal Nature by Paulo Mazzafera, a researcher of Universidade Estadual de Campinas, found that Ethiopian Coffea Arabica naturally contains very little caffeine, While beans of normal Coffea Arabica plants contain 12 milligrams of caffeine per gram of dry mass, these newly-found mutants contain only 0.76 milligrams of caffeine per gram with all the taste of normal coffee. It should be noted that the are varieties of Arabica that are closer in relation to the Robusta. Robsuta is genetically Arabica’s great grand-father. Robusta genetics will increase the amount of caffeine. As would the man made mixed varieties. Essentially this is the reason why Arabica is widely recognised as the king of coffee beans. Hence heirloom Arabica from Ethiopia is the king of kings of coffee beans. Note: there are some coffee drinkers that claim Robusta is required in a coffee blend, and there are even those that claim there are Robustas that are better than Arabicas. We at Quaffee are yet to be convinced. Robusta is one of the parents of Arabica. the other is Eugenioides. In a freak of nature the chromosomes of both parents were carried across to the sibling. This is probably the reason why Arabica is so different. It is a true blend of both of its parents, not just some from the one and some from the other. Some differences between Arabica and Robusta coffee. Coffea Arabica was first described by Linnaeus in 1753. There are a number of sub-varieties from which there are many different strains and cultivars have been developed. Such as Caturra (Brazil, Colombia), Mundo Novo (Brazil), Tico (Central America), the dwarf San Ramon and the Jamaican Blue Mountain. The average Arabica plant is a large bush with dark-green oval leaves. It is genetically different from other coffee species, having four sets of chromosomes rather than two. The fruits are oval and mature in 7 to 9 months; they usually contain two flat seeds (the coffee beans) – when only one bean develops it is called a pea-berry. Arabica coffee is often susceptible to attack by pests and diseases (being lower in caffeine), therefore resistance is a major goal of plant breeding programmes. Arabica coffee is grown in Central and East Africa, throughout Latin America, in India and to some extent in Indonesia. 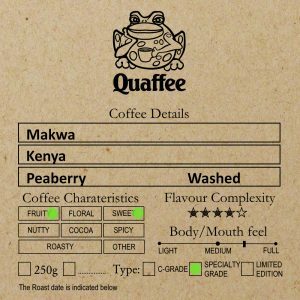 Quaffee only uses Arabica in their coffee since we prefer the taste. Originally found the the forests of Congo. The term “Robusta” is actually the name of a widely-grown variety of this species. It is a robust shrub or small tree growing up to 10 metres in height. Its a shallow root system means it is well suited to growing on a flatter surface. The fruits are rounded and take up to 11 months to mature. The seeds are oval in shape and smaller than those of Coffea Arabica. Robusta coffee is grown in Indonesia, Vietnam, throughout South-East Asia West and Central Africa, and where it is known as Conillon. Vietnam is the largest producer of Robusta with Brazil the second largest. Originally found in Liberia. Liberica coffee grows as a large strong tree, up to 18 metres in height, with large leathery leaves. The fruits and seeds (beans) are also large. Liberica coffee is grown in Malaysia and in West Africa, but only very small quantities are traded as demand for its flavour characteristics is low. Has been cross pollinated with Arabica to produce variants.Around 1% of the worlds coffee production is Liberica. We have removed that title from this post that original appeared on our old site, this was merely copied across when we pored.